In order to satisfy her artistic soul, Karon has worked with and conquered various media. Her first passion was designing and making stained-glass pieces, eventually surpassing and amazing her teachers by creating 3D likenesses of birds and butterflies. When limited space required that she give up her glass studio, she moved on to creating counted cross-stitch designs for boxes. The boxes were completely covered with charming stitched scenes reminiscent of her childhood in rural western New York state. These designs have been featured on the covers of magazines and won numerous national awards. 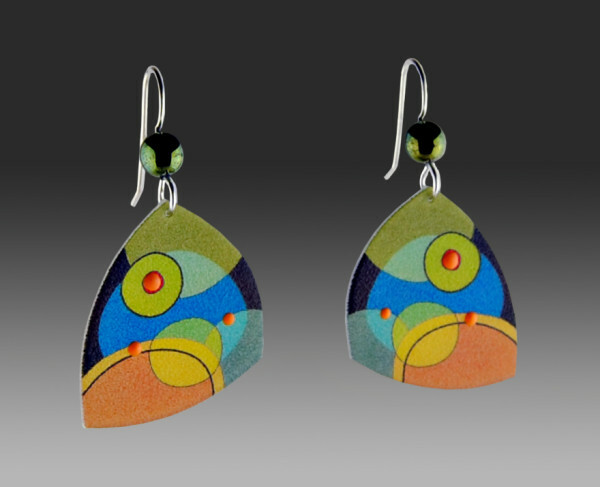 Karon now brings her enthusiasm for color and design to her new jewelry line. She loves finding novel and interesting ways to use beads and acrylics to create jewelry that is unique, fun and beautiful. She is committed to crafting colorful and affordable jewelry for you to enjoy and wear in good health.